Alexei Malakhov/Streeter THE WALL: Club Fed employee places convicts' mug shots and inspirational messages at the front of the pop-up shop. Ever feel that eating at some restaurants is like being sentenced to jail? Maybe not, but that’s the experience one pop-up eatery is going for on Bloor Street over the next two weeks. The U.S.- based Dave’s Killer Bread is opening Club Fed, which recreates a prison — albeit a rather trendy one — including a replica of the company’s co-founder Dave Dahl’s cell during one of his stays in a real prison. 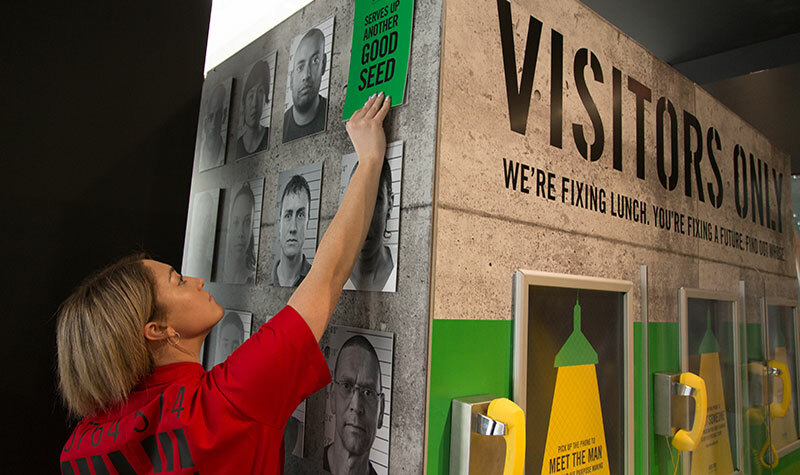 The theme is the importance of giving convicts second chances, a lesson learned by Dahl, who spent 15 years in and out of prisons before turning his life around — joining the family bakery, creating organic non-GMO bread which became “Dave’s Killer Bread” and formed the basis of a multi-million-dollar brand. The menu of sandwiches and sides is curated by celebrity chef Marc Thuet, who is known for, among other things, the television show Conviction Kitchen, in which he trained 12 ex-cons to run a restaurant. Fifty percent of proceeds from each sale are to go towards two charities that give ex-cons and at-risk communities a second chance. With a capacity of only 40 people, the pop-up is expecting to serve over 5,000 sandwiches and raise a minimum of $20,000 for the charities. Club Fed opened to prisoners — er, customers — today, running until Feb. 10 at 151 Bloor St. West. Hours are weekdays 11:30 a.m. to 8 p.m. and weekends 11 a.m. to 5 p.m.
Alexei Malakhov/StreeterIN PRISON: A replica of Dave Dahl’s own jail cell is featured at Club Fed. For more information and group reservations, visit the Club Fed website or check the hashtag #BreakBreadAtClubFed.